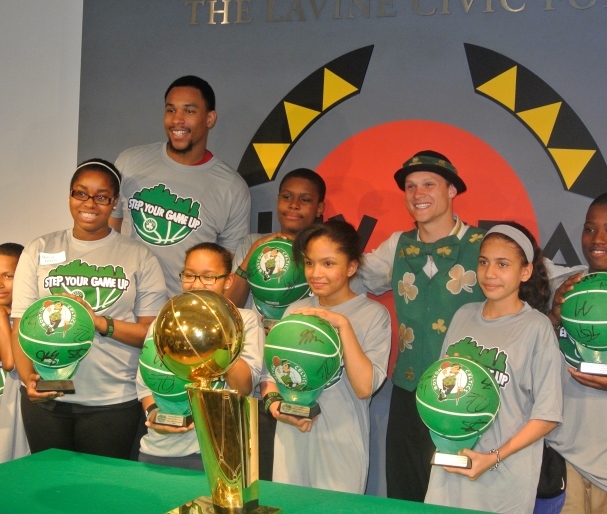 Celtics forward Jared Sullinger and mascot Lucky paid a visit to City Year headquarters Wednesday afternoon to celebrate the accomplishments of students in the â€œStep Your Game Upâ€� program. â€œI knew with my work and my wisdom and everything Iâ€™ve been through, I can hopefully say some words for them to know that education is the future,â€� Sullinger said. â€œStep Your Game Upâ€� focuses on students struggling academically, whether it be with chronic absences or failure in core subjects. The students are sent a letter from the program, challenging them to improve. This event focused on honoring 12 students who had shown significant improvement since joining the program. Burke, English, Young Achievers, Tobin, Dever-McCormack, Dearborn, Harbor, Mildred Ave, Neighborhood House Charter School, Irving, Orchard Gardens, and Higginson Lewis were schools represented by the students. Meyersohn also praised the Celtics' partner in the program, City Year, which had volunteers working the carnival-themed event, whether it was fortune telling, food serving, or games. Earlier in the year, Sullinger took students bowling with some of his Celtics teammates. At this event, Sullinger and Lucky took photos, played games, and presented raffle prizes. â€œI had fun all year doing things like this, because the kids really need something to uplift them,â€� Sullinger said. Growing up with parents who were teachers taught him the value of education, he said, and he hopes to relay that to students. â€œThey might not be a basketball player, they might not be a football player, but they can be something special in this world and develop our economy in this world to make it a better place,â€� Sullinger said. Zolan Kanno-Youngs covers Boston Public School athletics. He can be reached at kannoyoungs.globe@gmail.com. Follow him on Twitter @KannoYoungs.